We left Colby, KS with the intent of getting north to Ogalalla,NE and evaluating whether we needed to get up towards Valentine or farther northwest to Alliance. We stopped for lunch in Ogalalla ahead of the cold front with a surface obs of 88 degrees and a 45 dewpoint, meaning the cloud bases were near 10000 feet off the ground! 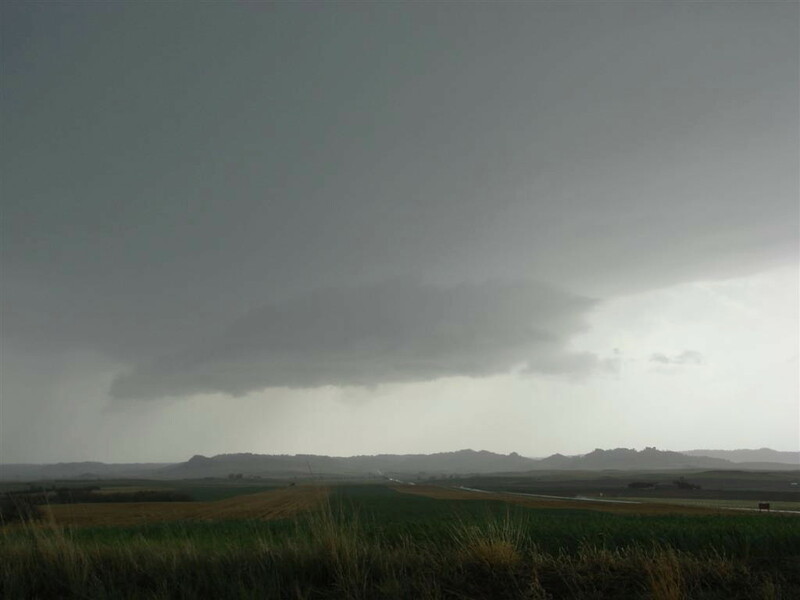 After a long wait, we got to the point where we could see a small cluster of storms getting started, along with a sort of dry line feature to our northwest, so we proceeded to Bridgeport, NE to intercept. Once we got there, we went north of the town to get a good view of the storm, which was a nice high-based storm with a big precipitation core that dropped some pebble hail on us. 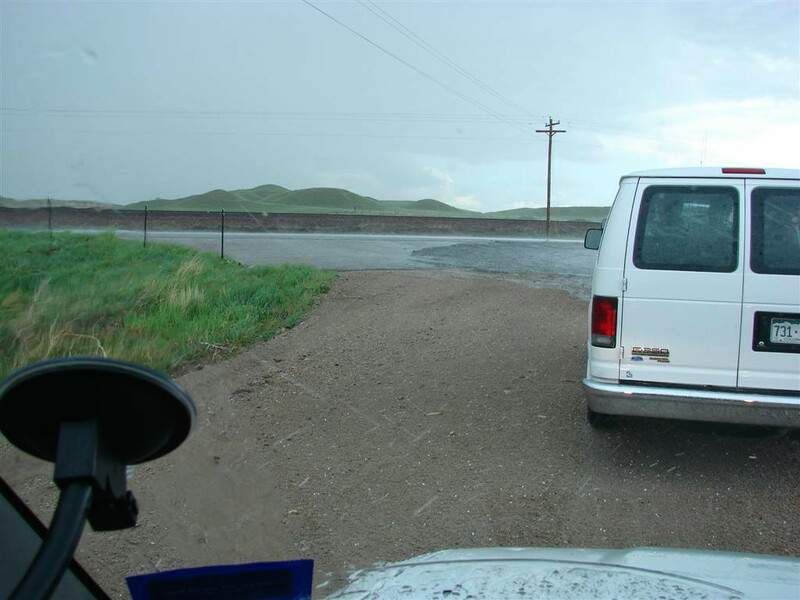 That storm appeared to be collapsing, and was heading into one of the infamous Sand Hills road holes, so we went north to intercept a group of three cells that were severe warned up near Chadron. By the time we got up there, the cells had been more or less cut off by a rogue cell moving north across their path and died a horrible death. We decided to circle around the back of those cells to Crawford and the tail end storm, which had pretty cool structure with a knuckling updraft, re-intensified. We pursued it through Hemingford to a point where we either had to plow into the core as it drifted off into another hopeless road hole, or break off south and more or less give up. Ultimately, we gave up. 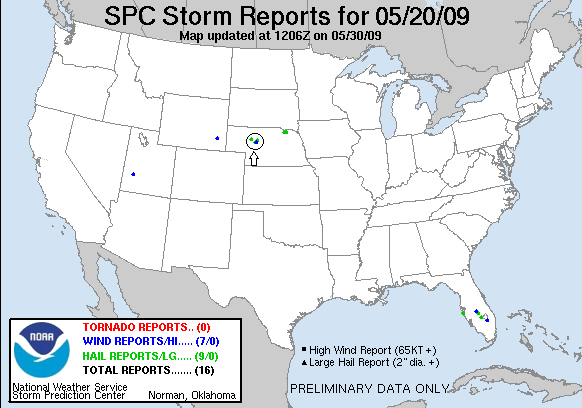 Little did we know at the time that if we had traveled on that northeast road for 1/2 a mile, we would have run into the entire Vortex-2 armada. 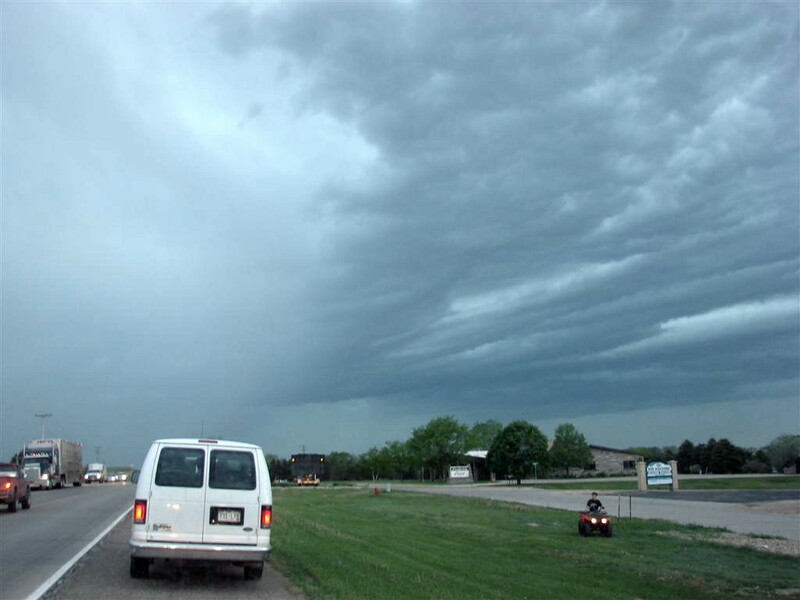 We eventually headed east towards Hyannis, NE, towards Thedford, where our original storm had become a powerful HP supercell, but even though it was moving very slowly we had no chance of catching it. We ended the night in North Platte, NE. The horrible Nebraska Panhandle roads won out this day, making it nearly impossible to get position on the storms. 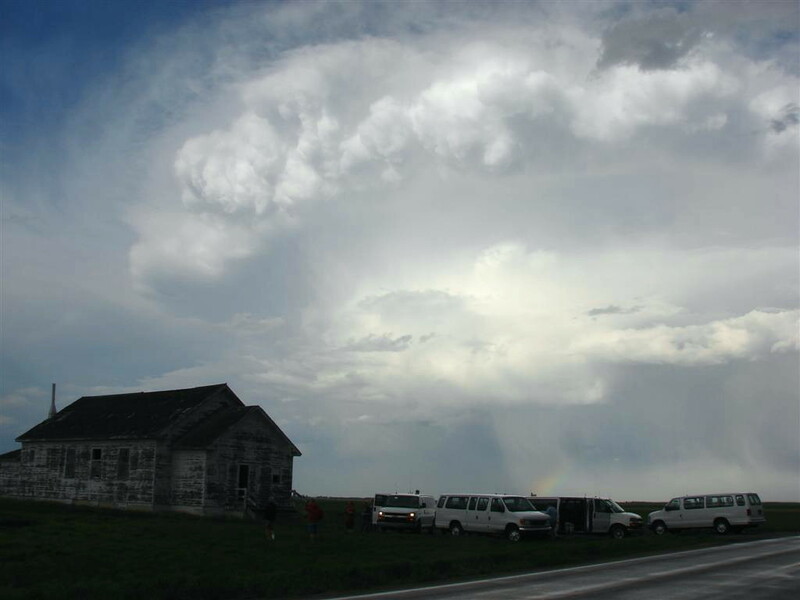 North of Bridgeport, NE we stopped to observe a hail core off in the distance. Eventually the core got to us. It contained small, pebble and maybe a few dime sized stones. Well, no tornado threat, might as well get right in the middle of the core. We were located where the white circle is in the leftmost cell. 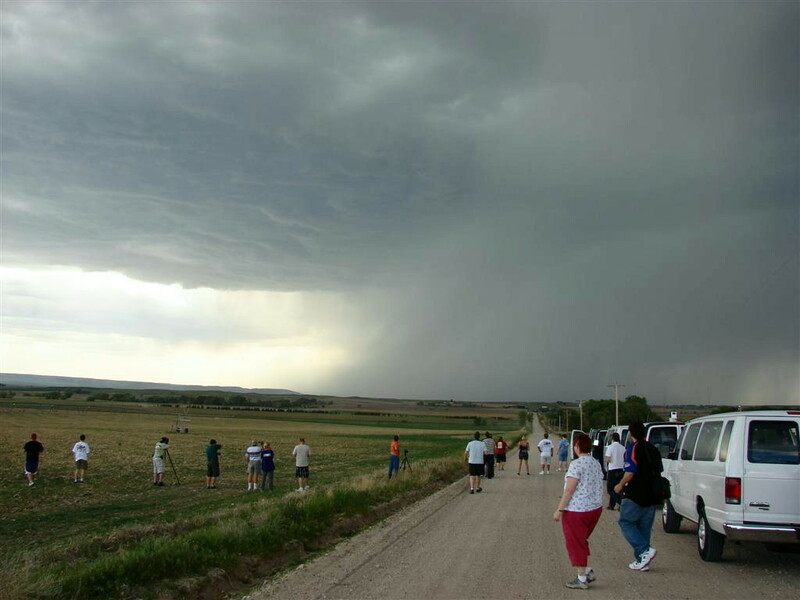 We proceed up to Chadron where another line of cells had developed but by the time we got up there it was a multi-cellular rain storm. We proceeded back to the southwest and found a strengthening cell with a well defined lowering. 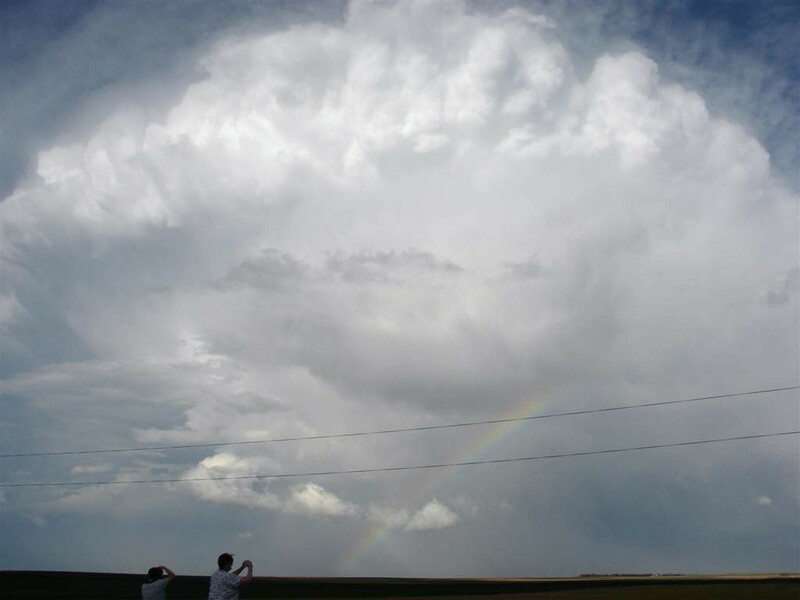 Along the back side of the cell, great cauliflower knuckling at the top near the anvil, and a rainbow to boot. Same cell with an old abandoned church in the foreground. Another shot of the church.